This tutorial will guide you through the steps of setting up WiFi on your chipKIT WiFire. Make sure the Arduino IDE is installed. Add the chipKIT boards from Digilent to the Arduino IDE using the board manager. 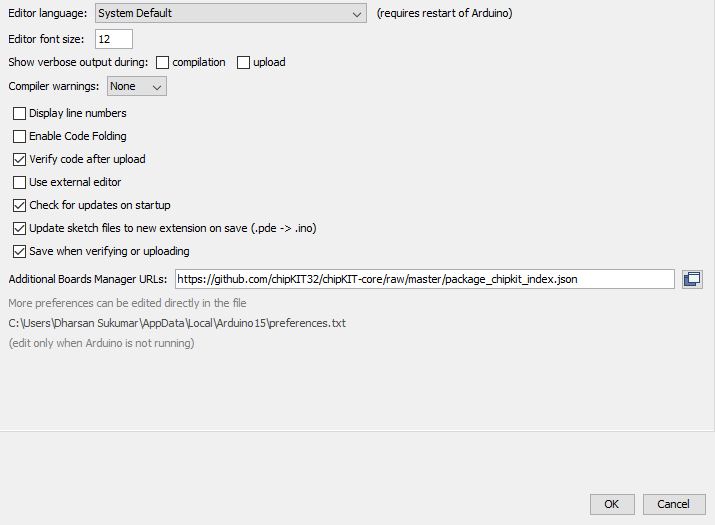 If the Arduino IDE version is 1.6.7, it is possible to auto install the chipKIT boards via URL. This is the easiest method available! Check out the picture below of the dialog box to make sure the fields are filled out correctly. Go to Tools→Board→Board Manager in the Arduino IDE which will open a menu with all the packages you have. Scroll down to the chipKIT section and click on it. Click the install button to install the chipKIT boards. Once the install is finished, close the window. All of the chipKIT boards are available under Tools→Boards! 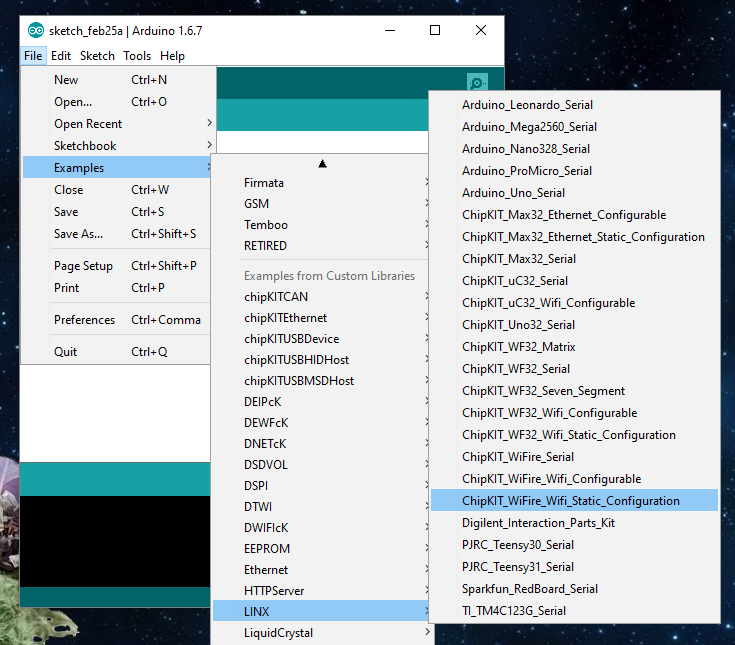 When the VI opens, browse to the Arduino Libraries folder usually located in <Documents>\Arduino\libraries. 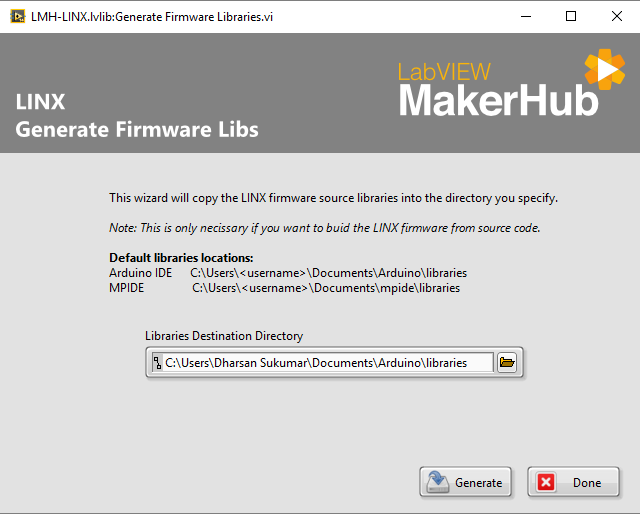 Click generate and the LINX libraries will be pasted into the Arduino libraries folder. 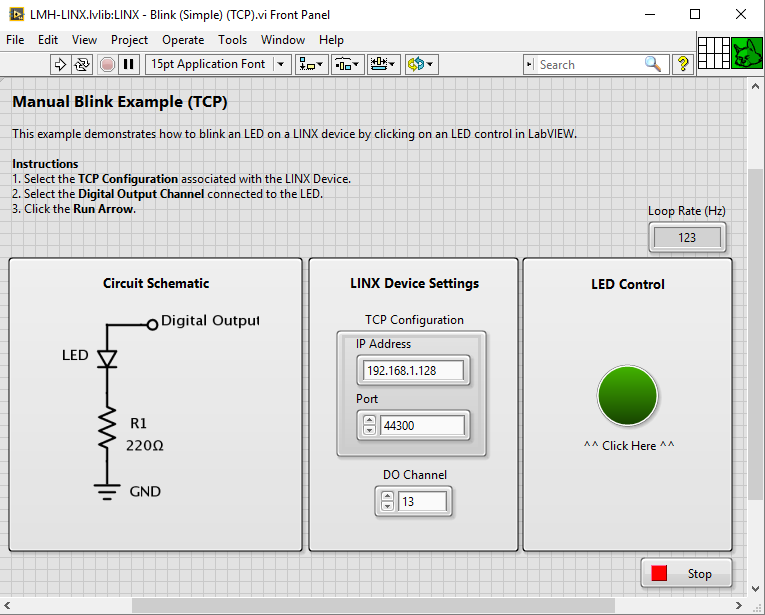 Open the Arduino IDE and go to File→Examples→LINX→ChipKIT_WiFire_Wifi_Static_Configuration. This will open the WiFire static WiFi firmware. Click the Tools drop down and make sure to select the correct board and the correct COM port. Scroll down to void setup() and find the WiFi settings pictured below. Enter the network settings. Pictured below is an example network with an SSID “The coolest network” and a password of “mypassword”. The IP address was left the same (192.168.1.128). Enter any IP address that fits the default gateway. Make sure the WiFire is connected on the correct COM port you selected and click upload. The firmware will then compile in the Arduino IDE and upload to the board. Once the firmware is uploaded, close the Arduino IDE. 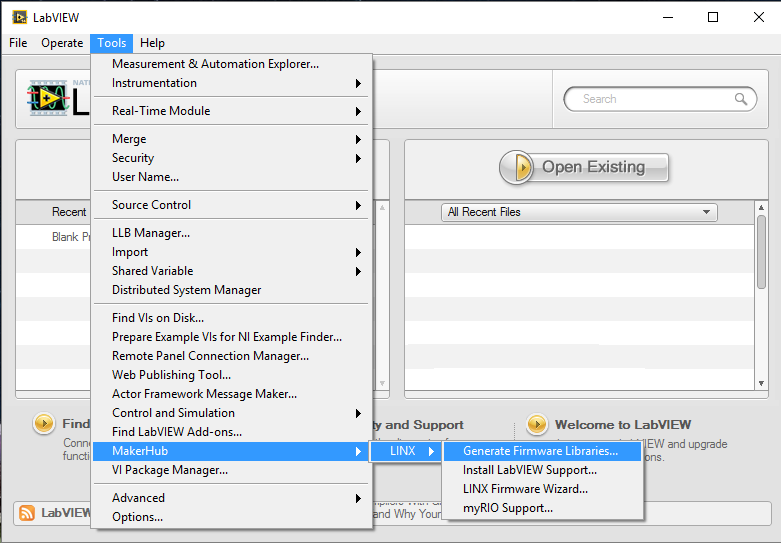 Open LabVIEW and go to Help→Find Examples. Click search and search for “LINX”. 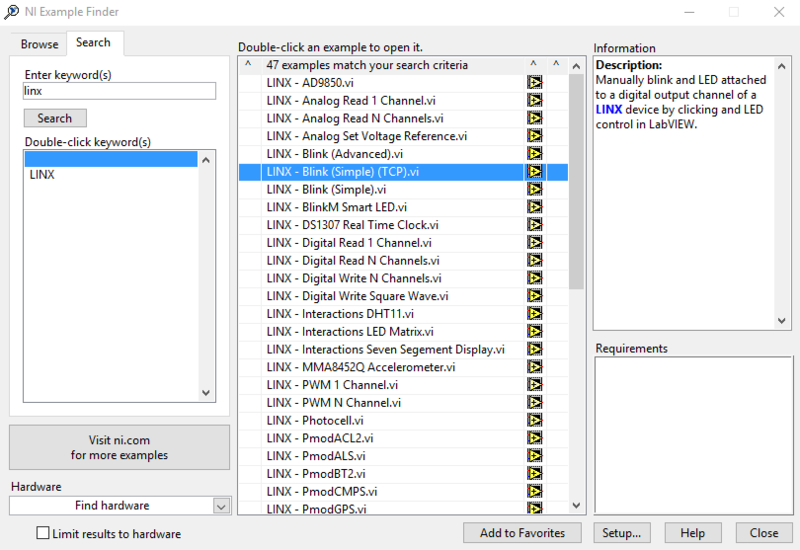 On the LINX search results, find: LINX - Blink (Simple) (TCP).vi. Double click the VI to open it. Once it's open, enter your WiFi information (pictured below) and click the run button. Blink the on-board LED by clicking the boolean control! This tutorial goes over how to set up WiFi on the chipKIT WiFire. If you have any questions please post on the LINX forums. If you've created a cool project, consider sharing your work with the community in the forums.